Made with sugar and spice and everything nice…then stuffed full with cream cheese and raisins. What’s not to love about these gluten free cinnamon bun pancakes? Great for brunch – quick to assemble and your guests (gluten and non-gluten eaters) will think you’re a culinary genius. And waaaayyyy easier to make than actual cinnamon buns. Top with a cream cheese glaze if you want to be extra decadent! 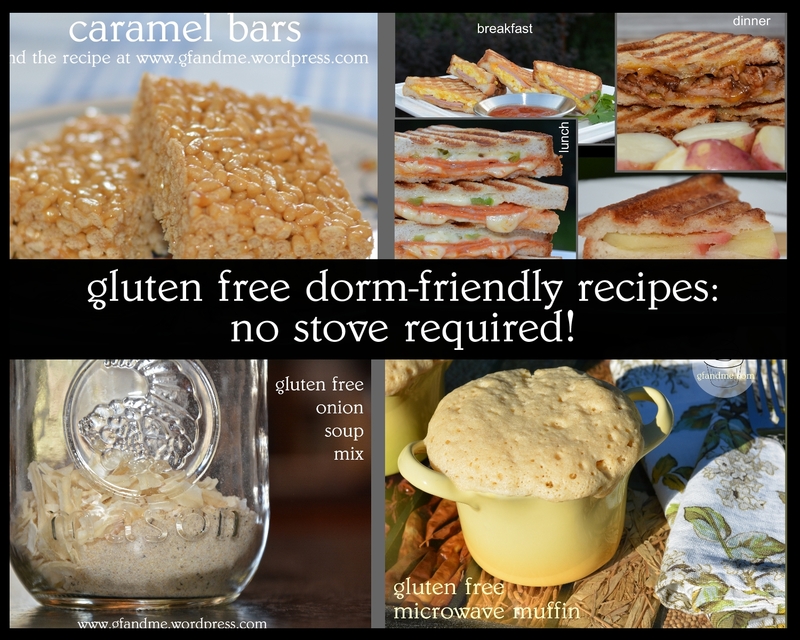 Check out gf & me’s newly updated alphabetical index – links to over 100 of gfandme’s recipes listed on one simple page. muffins, cakes, scones, pastry, pie, cream puffs, brownies, breads, cheesecakes, casseroles, candy, pizza, sandwiches, tarts, pastas, stir fry, soups, squares …. Back-to-school is just around the corner and along with it comes the need for quick and easy gluten free meals. 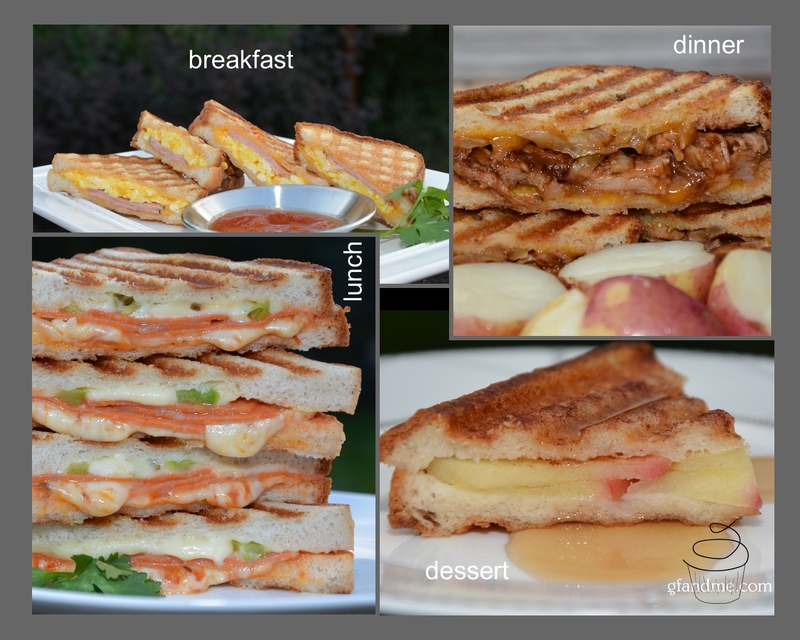 We find that on those busy days nothing beats a grilled sandwich, so here are four recipes for gluten free panini that were inspired by Dempster’s new Gluten Zero breads: ham and egg, pizza, pulled pork, and apple pie. All but the pulled pork sandwich are great hot or cold so you can make these ahead of time and pack them up in lunch bags to go! Below you will find a review of Dempster’s Gluten Zero Bread followed by our breakfast, lunch, dinner and dessert Panini recipes! Looking for a quick and easy breakfast or snack idea? This muffin recipe makes a single, large muffin that bakes right up in the microwave. 90 seconds and you have a warm breakfast to go! And it’s gluten free! The recipe is for a basic muffin that you can then put your own touch on. The one in the foreground of the photo is raspberry and the one in the background is chocolate chip. You can also swap out some of the gf flour for cocoa and build yourself a chocolate version! 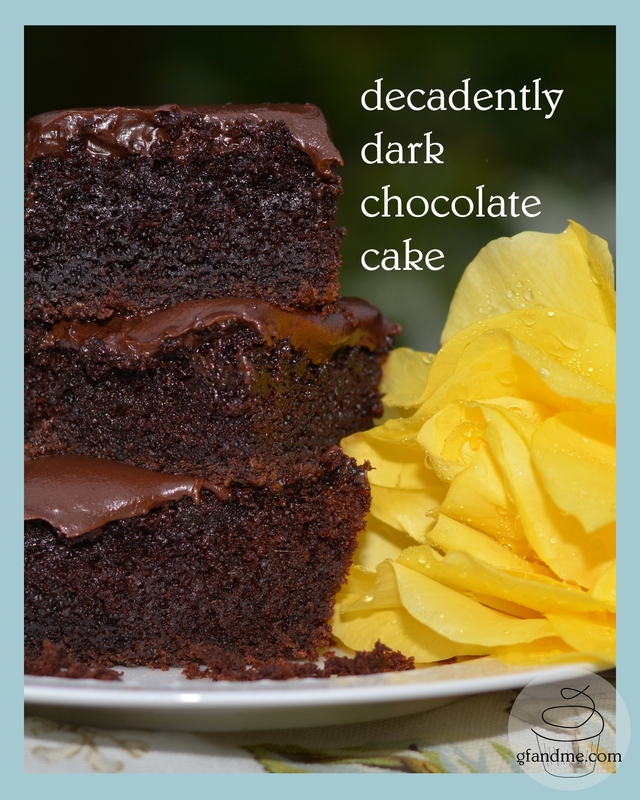 dark, dark, dark gluten free chocolate cake …. Did I say it was dark? The next time you feel like chocolate cake – and let’s face it, there WILL be a next time – try this one. Made with 3/4 of a cup of cocoa, it is chocolatey to the point of decadence, and because it’s made with boiling water, it’s also really, really moist. One of those rare gluten free baked items that actually improves with age, this cake will be even better tomorrow, which is a good thing because the recipe makes one big ol’ sheet cake. For those of you who are better at cake decorating than I am (which will be most of you!) this would make a great decorated layer cake. 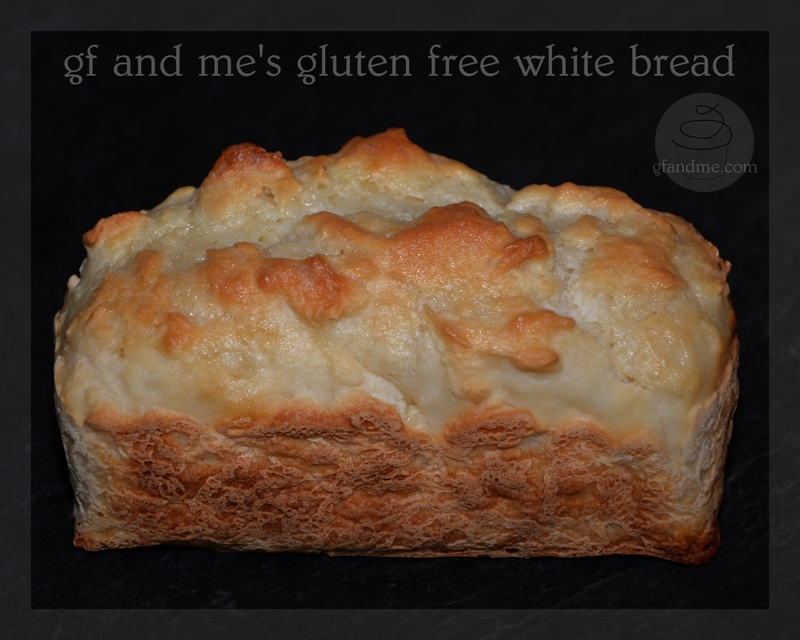 I have served this to unsuspecting guests who have had no idea that it was gluten free! The coconut flour in this recipe gives this crust a wonderful tropical flavour and the texture of a medium-hard cookie more than a classic pie crust. 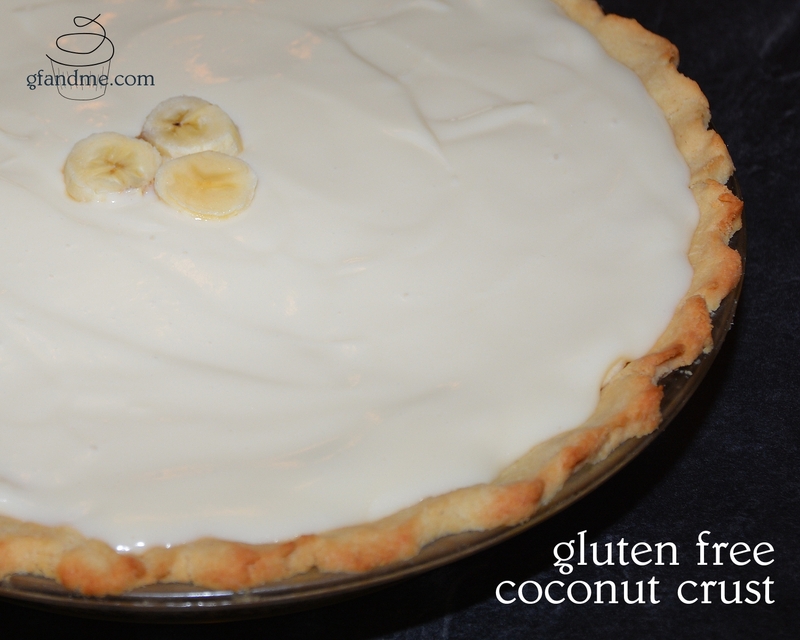 Its hint of coconut pairs wonderfully with coconut, vanilla, or banana custard to make an out-of-this-world cream pie that everyone will love. Once you round up the ingredients, this recipe is ridiculously easy and results in a lean, white bread with a soft crumb & a salty light-yet-crispy crust. However, the best part is that it tastes closer to white, wheat-flour bread than anything we’ve tried so far. In fact, it barely has any taste at all. Instead, it doesn’t mind taking a back seat and letting the flavours of whatever you pair it with shine through – just like we believe white bread should do! 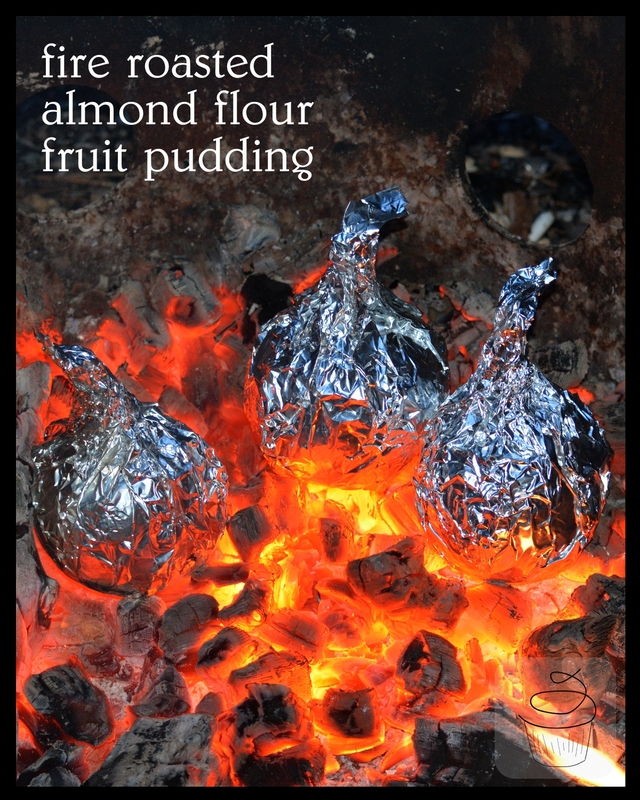 When you’re cooking on an open fire, desserts other than s’mores or roasted marshmallows can be hard to come by. If you’re in the mood for something different, follow this recipe and create a sweet, orange-infused pudding with a hint of almonds and cinnamon. The almond flour makes it creamy and the dried fruit adds taste and more texture. Top with a spoon full of gluten free caramel sauce for an extra decadent treat. This pudding recipe is an adaptation of Nourishment for Living Well’s almond flour raspberry muffin recipe. 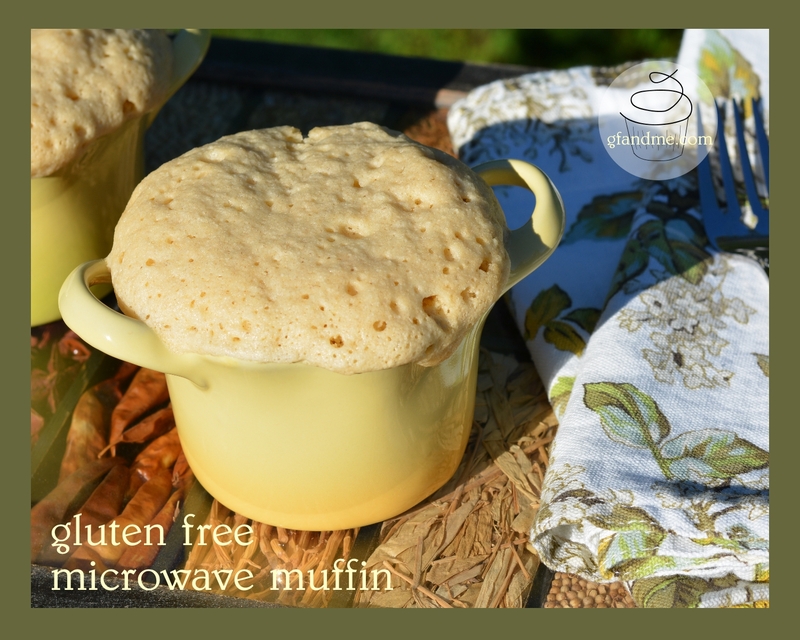 Click here to find a link to the recipe and to read our review of these awesome muffins! 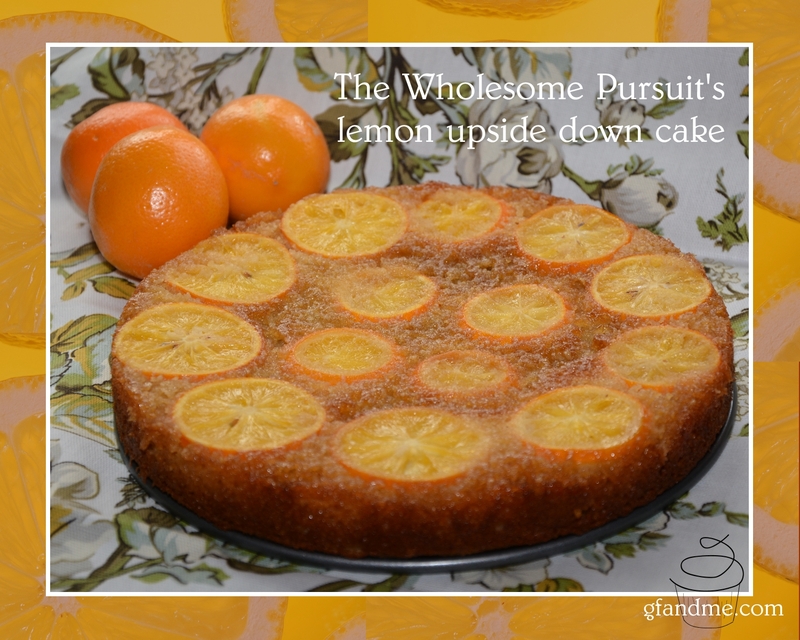 If you like lemon, you’ll love The Wholesome Pursuit‘s flourless lemon upside down cake! It’s moist and not too sweet with a zesty lemon flavour that’s out of this world. And believe it or not, it’s gluten free, dairy free and healthful! See below for the rest of our review, what we did differently, and the link to the recipe.